Q. How can I tell if my dog has a dental problem? A. Many pets show absolutely no signs. Some pets may have bad breath, reluctance to eat, drooling, bleeding from the mouth etc., however due to the high percentage that have no signs it is essential to have a thorough oral examination at least yearly by your veterinarian. Q. My dog has already had several teeth removed as part of previous treatments. What more can I do? A. If your pet has had teeth removed previously therapy doesn't stop there. The remaining teeth are prone to the same progressive process that resulted in extraction previously. Regular dental cleanings under anesthesia at your veterinarians office in addition to a thorough oral examination, periodontal probing and dental x-rays are essential in determining the extent of the disease in the remaining teeth. Mere observation is not accurate in determining periodontal disease status in pets. Home care is an important adjunct to periodontal care at the veterinary hospital and should be done regularly between in-hospital cleaning. Q. I am very worried about having to put my dog under anesthesia. Can you alleviate concerns? A. Your concerns are well founded. Anesthesia is an essential portion of proper oral care for our pets. A thorough screening including a physical examination, blood evaluation, EKG and in some cases x-rays of the chest and abdomen are indicated to determine your pet's overall health status. If these tests do not reveal problems anesthesia is considered safe. Modern anesthetics and drugs used for premedication are much safer than they have been in the recent past. Monitoring capabilities have improved tremendously as well. Q. Isn't bad breath just normal for dogs? A. If a dogs breath is offensive then the shift from normal bacteria to those that cause periodontal disease has occurred. It is an indication that there are problems that need to be addressed. Pockets deepen as disease progresses creating more places for bad bacteria to hide and produce more disease and more odor. Q. What should normal gums in a dog look like? A. Gums should be pink with the gum margin the same color as the rest of the gum tissue. Black pigment is normal in dogs however and may occur in various places of gum. Any red areas are problems. Q. Can bad teeth result in any external manifestations on my dog? A. Research shows that the heart, liver, kidney and lungs undergo disease in patients with periodontal disease. Therefore this process has the capacity to produce problems in these organs. Q. Does it matter whether my dog eats hard or soft food? A. Hard dog food has the function of raking tartar from the tooth while chewing. Since dogs chew in the back of the mouth the premolars and molars are the teeth that are mostly affected. Q. When is my dog too old for daily dental care? A. All dogs should be monitored for periodontal disease and receive regular home care and dental cleaning and evaluation at their veterinary office. Age is not a disease. Animals should be evaluated as indicated above and if disease is present and their blood and health evaluations are fine then consideration should be given to anesthesia and proper cleaning and periodontal care. Q. What can I do to avoid tooth breakage in my dog? A. Any hard chews that are not bendable can cause tooth fracture. This includes ice, rawhide and other hard substances. Q. What are appropriate chew toys for my dog that will not damage her teeth? Q. I just noticed that my dog has a broken tooth. It doesn't seem to bother him. Should I be concerned? A. Most dogs don't show their pain when teeth are fractured. They all are painful. The pulp is alive and contains nerves. When treating these patients we can elicit the pain response just by passing air over the exposed pulp under light anesthesia. With that response we know they are painful. As the pulp dies then so does the nerve. But when it dies it gets infected. The infection then reaches the bone surrounding the root of the tooth and starts to eat it away and then the pain returns. All fractured teeth should receive root canal treatment ideally or at the very least be extracted. Brett Beckman, DVM, was recently appointed the 2008-2009 President of the American Veterinary Dental Society. He is a graduate of Mississippi State College of Veterinary Medicine. He holds advanced degrees as a Fellow of the Academy of Veterinary Dentistry (one of 77 such vets in the world), as a Diplomat of the American Veterinary Dental College and as a Diplomat in the American Academy of Pain Management making him the only specialist in the world in both veterinary dentistry and pain management. Dr. Beckman was also a nominee for the Bustard Veterinarian of the Year Award and was named 2007 Alumni of the year for Mississippi Sate University College of Veterinary Medicine. Dr. Beckman has published numerous peer-reviewed articles in his field and lectures extensively throughout the United States. 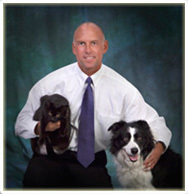 Dr. Beckman owns and operates Florida Veterinary Dentistry and Oral Surgery in Punta Gorda, Florida. And in 2005, the Veterinary Dental Education Center opened its doors in Punta Gorda. It is a state of the art training facility, one of the few in the country, dedicated to advancing the educational needs of veterinarians and veterinary technicians around the world in the field of dentistry and oral surgery. Dr. Beckman is also the official veterinarian for Gulf Coast Pet Partners, a non-profit organization that provides pet visitations to nursing homes, hospitals and mental health facilities.